On the occasion of Anusham (Jan 30), the birth star of Mahaperiyavah, Mylai Mahaperiyavah Anusham Trust conducted its monthly celebrations. Throughout the day, hundreds of devotees gathered to offer their prayers. Various religious activities were held from the morning. At 5.30 pm, Lalitha Sahasranamam was recited. 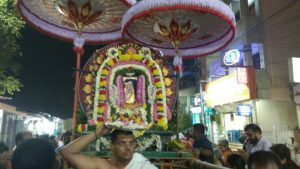 After a pooja at 6.30 pm, the portrait of Kanchi Mahaperiyavah was taken in procession around the Mada streets. The procession was led by artistes who played nadaswaram and thavil. Puliogare and curd rice were given as annadhanam to the devotees. The Trust is located at 52/2, Sree Ganesh Flats (Ground Floor), North Mada Street, Mylapore. This entry was posted on Wednesday, January 30th, 2019 and is filed under Religious. You can follow any responses to this entry through the RSS 2.0 feed. You can skip to the end and leave a response. Pinging is currently not allowed.